Two years ago, Andrew Torgashev was creating a name for himself as an up-and-coming skater who was turning heads on the junior level. At just 13, he had won the U.S. Junior National title and finished in the top ten at the 2015 Junior World Championships. But then, three months later, while preparing to make his senior debut, Torgashev fractured his right ankle, sidelining him for the 2015-2016 season. Torgashev returned to international competition in the fall of 2016. 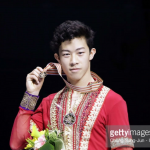 In his two Junior Grand Prix events, he claimed the silver medal in Saransk, Russia, and finished just off the podium in Dresden, Germany. He also won a bronze medal in his senior international debut at the ISU Challenger, Tallinn Trophy, in Estonia. As the youngest senior men’s competitor at the 2017 U.S. Championships in January, Torgashev finished eleventh in his senior national debut. As a result, he was named to the World Junior team and will compete in his second World Junior Championships, March 15-19, 2017 in Taipei City, Taiwan. Figure Skaters Online caught up with Torgashev before he left for Taiwan. 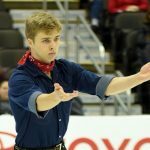 Figure Skaters Online (FSO): You were very excited after your free skate at the 2017 U.S. Championships in Kansas City. What were your thoughts following your skate? Andrew Torgashev (AT): I thought that it was a great start to my senior career. I had some problems when I was training and I was just very happy to go out there and put out two great programs. Of course, they could’ve been better, but that just tells me that there is more work to be done. FSO: How would you assess your National debut at the senior level? What were you most proud of? AT: I thought that it went pretty well. I kept myself calm throughout the whole competition and I was very proud of myself for that. I would have to say that the second I landed my quad [toe loop in free skate] was my proudest moment from Nationals. FSO: What did it mean to you to be back at Nationals after your injury last season? AT: I was working day and night to heal my ankle and I have been looking forward to finally making my senior debut since the second I got injured. FSO: At just 15-years-old, you were the youngest skater in the senior men’s event. Do you see your youthfulness as an advantage in this sport? AT: Yes, of course, I see it as an advantage. It sets me aside from the majority of the skaters and makes me feel a bit special, honestly. FSO: You moved up to the senior level nationally at a time when the technical difficulty for senior men has reached an all-time high, both nationally and internationally, with skaters attempting multiple quadruple jumps. How does that affect your training? What are your thoughts on the increased difficulty and pressure in the men’s discipline? AT: Since everybody is doing all of these quads, it means that I also have to keep up with the trend. I need to train hard but also train smart to be able and achieve my goal, which is to be at the top in the world. When I started this sport, I loved it because there was no limit to what you can do on the ice. These guys doing all of these quads proves this and keeps me intrigued and interested in the sport. FSO: How did you feel after you found out you were named to the 2017 World Junior Championships team, especially after sitting out last season? AT: I have been waiting to be back on the team for a really long time. I am so happy and proud of myself that I was able to make it onto the team this season. FSO: You finished 10th at Junior Worlds in 2015. What’s your goal for the event this time around? AT: There are many great skaters going to this event. All I can ask of myself is to skate my programs to the best of my ability. As long as I do that, I will be proud of myself, no matter the placement. FSO: How has training been since you got home from Nationals? What have you been focusing on and have you made changes to your programs? AT: I have been training hard and increasing my stamina on and off the ice. I am adding another quad in the free skate; other than that everything is mostly the same. FSO: Your mom (Ilona Melnichenko) and dad (Artem Torgashev) are your coaches. How is it having them as your coaches and what type of coaches are they? AT: They’re tough. We respect each other’s space off the ice and work hard on the ice. I think that they are the best fit for me. FSO: Have you given any thought to next season and what you like to skate to? AT: Yes! I don’t want to give anything away, but I have two great pieces of music lined up. I’m very excited to start choreographing them with my coach and mom (Melnichenko) and Scott Brown. FSO: Any plans for the off-season? Any vacations? AT: No time for vacations, but I will get a lot of rest! FSO: You are skating in the Skate for Hope show on June 17 in Florida. What does it mean to you to perform in this benefit? AT: I always want to find ways that I can help people in need. I’m glad I finally have the chance to do this while doing something I LOVE. FSO: How do you balance high school and skating? What’s a typical day like? AT: Well, I wake up around 4:45 a.m., then eat breakfast and head over to the rink to do an hour of choreography and skating skills from 6:30 a.m. – 7:30 a.m. After that, I go to school from 8:30 a.m. – 12:00 p.m. and then go back to the rink. I skate two afternoon sessions (1:15 p.m. – 2:15 p.m. and 3:45 p.m. – 4:45 p.m.) and after that I have PT (physical therapy), workout and recovery from 5:00 p.m. – 7:00 p.m. Of course, then I get home and need to do some homework before I go to bed. FSO: What is your favorite subject at school? Least favorite subject? AT: Well, That’s a tough one. I don’t have a favorite subject, but all of them are my least favorite. FSO: You had started a clothing line (Classique de Champion) with your high school friend, Parker. Any plans to start that up again in the future? Why did you choose clothing? AT: Maybe I will start it up again once I have some more free time. I just found clothing to be the best match for my interests and I have a lot of knowledge about what feels and what looks good. FSO: What do you want to do when you finish high school and finish with skating? Do you want to go to college? AT: I really want to create my own business and become a millionaire. I would probably have to do college online, due to training and pursuing my skating career. FSO: Are you going to prom? AT: As long as I have a date! AT: My lucky Bodybuilding.com water bottle. I can’t leave home without it! FSO: If you could live in any place in the world, where would you live and why? AT: Honolulu, because of the beaches, the weather, the culture and I’ve always wanted to go to Hawaii. FSO: If you were a Crayola crayon, what color would you be and why? AT: Red, but I have no idea why! FSO: If you were visited by a genie and given three wishes, what would your three wishes be? AT: I wish for a 2017 McLaren P1 (British limited-production plug-in hybrid sports car). I wish for an Olympic gold medal and I wish for three more wishes!